We finished our five-session arc of With Great Power . . . last night. It’s certainly the best gaming experience I’ve had in years, and in the short-list for my best gaming ever. From start to finish it was pure joy. A lot of that joy was contextual: as noted I am a madman on the subject of Silver Age Marvel comics, and I was lucky enough to have two magnificent players (Sternum and Invincible Overlord) who, in addition to also being huge fans, were terrific role-players and enormously funny people. The Thing single-handedly defeated a Troll army that was marching on Asgard (including clobbering Ulik, who had humiliated and enslaved him last session). Spider-Man, tapping into the power of the Norn Stone, defeated the mighty Thor in single combat. 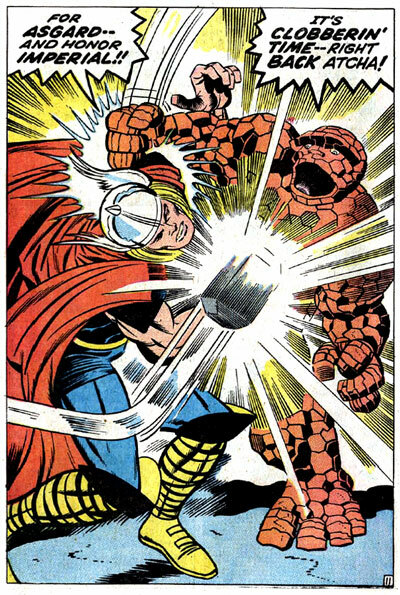 Just as he was about to steal Thor’s hammer in accordance with Loki’s sinister plan, Peter Parker realized he was going too far–and returned it to the thunder god. The Enchantress, who had seduced Peter into near-villainy, came to understand that, though nought but a mortal, his heart was more valorous than many an Asgardian’s. There was a funny scene when the Thing tried to tell-off Odin the Omnipotent, but the All-Father basically yawned him away. Loki, frustrated, made a play for the indestructible Destroyer. There was a big fight between Spider-Man, the Thing, Thor, and the Fantastic Four against the Loki, the Destroyer, the Radioactive Man, the North Vietnamese Army, and the United States Air Force. In the end, the heroes triumphed (of course). And some of the joy was due to the system, though I’m not sure how much. With Great Power . . . is played with a deck of cards rather than dice. You generally want high-ranking cards, and in order to get them the player will choose to sacrifice certain aspects of his or her character. Thus, Spider-Man might ignore Aunt May for a little while in order to save the city. In mid-game, however, many of these aspects fall into the clutches of the Game Master, who can then do sadistic things: like say that Aunt May has gotten engaged to Doctor Octopus. In the end-game, a couple of rules shift around to favor the players, and if they’re lucky they can save the day and any spinster aunts. So – best supers gaming I’ve ever had, and a good time was had by all. Excelsior! Anyway, after years of dreaming about it, I finally found Adrian and Josh, who are almost as insane as I am on this topic. Though I’ve always been curious about the old Marvel Super Heroes game, I had a good experience using With Great Power… at a NerdNYC Recess and decided to go for the glory. With the exception of a Dictionary of Mu game a few years ago, this has been the most fun I’ve ever had running a game. First and foremost, Josh and Adrian are a lot of fun to play with. Adrian does an awesome J. Jonah Jameson voice and is always thinking of little details to add into every scene. Josh, I think, was born to play the Thing: everything he says and does is so wonderfully in-character. And With Great Power… is just a terrific system to use with this material. But the other players at the table are the spirits of Stan Lee, Steve Ditko, and Jack Kirby. We spend a noticeable chunk of each evening laughing at how lovably goofy Silver Age comics are—last night, we were all deeply in love with Ulik, chief warrior of the rock trolls of Asgard, he of the “universally-dreaded body-crushing blow!” It’s a joy to take my geek-corset off and just let it all hang out with people who appreciate King Cadaver as much as I do. We had an “impersonate Cobra” contest a couple weeks ago, and if you don’t know why that’s funny I feel kinda sad for you. As alluded to in my post following a nice-but-disquieting Dungeons & Dragons 0e game, one of the things I most enjoy about campaign-style play is an attachment to the world and the characters in it. Our group knows the Marvel Universe very well indeed. Our imaginations have been steeped in it for thirty years. It’s a beautiful thing to have everyone at the table be totally into what we’re doing. It’s not so much immersion, whatever that may mean, but absurd levels of imaginative commitment. Buy-in is 100%. Creative agenda is go. Prepare to thrash. This is degree of emotional investment can only* come from decades of beloved canon material. This is why people don’t care so much about your homebrew rules about which Elven dynasty slew the Dwarf King 439 years ago. It’s not that it’s boring: most of The Lord of the Rings is boring to a sane person. But if you’re a huge Tolkien nerd, the history of the Ring of Erech matters to you because you’ve invested a ton of time to learn such nonsense. Your homebrew didn’t entertain your players for years or decades (yet). Another way of saying this: in response to Jeff Rients’s pop quiz, trademarks matter, because you come to form attachments with what’s familiar to you. And what that means for Old School games is that the true pleasure of campaign play is having an emotional stake in the growth of the campaign. This is something that the Old School community needs to ponder—how do you increase player investment in a homebrew setting with vastly unequal degrees of authorship? * Well: emotional investment can also come from committed, empowered authorship. But very few older role-playing games distribute authorship evenly around the table. Usually you’ve got the Game Master who is madly in love with a homebrew campaign he’s developed over 100 hours or more. And he’s got five players who have spent 20 minutes each creating characters, and who can’t really be bothered to figure out the sub-plots or which supporting cast member is which. ** Quicksilver’s great at dodging things, but he’s not especially great at ranged combat, so it would probably work better as a Danger Sense power, at least practically speaking. I am sorry for the bad things I mutter about you sometimes Jeff Grubb! I am sure you are Incredibly nice and awesome.